It is my pleasure to join you for the Eighth Convocation of Malaviya National Institute of Technology (NIT) Jaipur, which is being held in its Golden Jubilee Year. I congratulate Professor K.K. Aggarwal, Chairman, Board of Governors, Professor I.K. Bhatt, Director, and the entire fraternity of NIT Jaipur on this Institute completing fifty years of dedicated service to the nation. NIT Jaipur has produced professionals of high calibre. From a mere 12 students when it started, it has a student population of 4,800 today. It has proliferated from just two disciplines to nine under-graduate and eighteen post-graduate programmes in various branches of engineering, science, humanities and management. Its PhD programmes are devoted to cutting edge research and technology. In its endeavour to keep pace with the latest trends in curriculum and technical resources, it has instituted Centres of Excellence for Energy and Environment, Design, and Materials Research. The success of this Institution is the result of the vision, commitment and labour of its past and serving faculty members. I take this opportunity to pay my tribute to Professors Vinayak Govind Garde and R.M. Advani, the first two Principals of this engineering institute. NIT Jaipur is named after Pandit Madan Mohan Malaviya, one of the architects of Modern India and a leader of India’s freedom struggle. A visionary, statesman, scholar, educationist and social reformer, Malaviyaji made a sterling contribution in creating a holistic template of education in our country. He wanted our educational institutions to take the best of eastern learning and western scientific knowledge. He felt that the objective of higher education should be to provide a bridge between scientific knowledge and societal needs. He wanted students to be inculcated with human values and a sense of social commitment. The fact that in the India of today, our society is still bothered by moral unrest, reminds us of the task ahead of us. Perhaps, the time has come to reset our moral compass. We must reverse the value erosion in society, and for that, we must instill in our youth the essential civilizational values of love for motherland; performance of duty; compassion for all; tolerance for pluralism; respect for women; honesty in life; self-restraint in conduct; responsibility in action, and discipline. Our academic institutions must play a leading role in guiding the young minds in this direction. Dr. S. Radhakrishnan had said and I quote: "It is necessary that in the universities, the traditional values should be encouraged…you must see to it that the values which you have had are properly assimilated by the students, accepted by them and made a part of their very being” (unquote).” I call upon the entire NIT Jaipur community to follow this as an article of faith. The students must have a clear perspective in their minds as to what education means to them; as to what success implies; as to whether a good professional career with an attractive salary is the be-all and end-all in life. You must understand that considerable resource, effort and sacrifice have gone into your education. Society has invested in you and society can legitimately demand a dividend from you. You can pay this dividend by helping those who are weak, needy and deprived. The destiny of our nation will be shaped by your will power, initiative and ingenuity. Change often precedes progress. If you feel anything is hindering our progress; our growth, change it. Do not join the brigade that only clamours for change; join hands with those who believes in doing. Science and engineering have benefitted mankind immensely. When we gained Independence, our colonial rulers left us with an India afflicted by poverty, hunger, illiteracy and backwardness. During the period 1900 to 1950 India's economy grew at a rate of 1.5 percent. A major development exercise was initiated by our leaders and in the next 30 years, we grew at a rate of 3.5 per cent. This grew to 5.5 per cent in the 80's and 6 per cent in the 90's. Despite a global slowdown and several bad years, our economy grew at 7.5 per cent in the last ten years. All this development became possible because our founding fathers emphasised science and technology. Pandit Jawaharlal Nehru once said and I quote: "It is science alone that can solve the problems of hunger and poverty, of insanitation and illiteracy, of superstition and deadening custom and tradition, of vast resources running to waste, or a rich country inhabited by starving people... Who indeed could afford to ignore science today? At every turn we have to seek its aid... The future belongs to science and those who make friends with science.” (unquote). These words are still relevant to us in our ongoing endeavour to become a global power. By applying science; by innovating; by developing new technology, and new products and processes, great transformation can be brought about. Many relatively weak countries have emerged into stronger economies in a short span of time on account of that. Innovation has lent competitive edge to business, and provided solution for effective governance. Technological applications like mobile telephony, internet, e-transfer of benefits, e-medicine and e-education have made the lives of common citizens much easier. Governments around the world are making a concerted effort to encourage innovation. In India, we have firmly resolved to give centre stage to innovation. We have dedicated the decade 2010-20 to innovation. We have formulated the Science, Technology and Innovation (STI) Policy this year, for innovation to spur development. This policy calls for an eco-system where innovation activity thrives. It portrays the need to right-size our research and development system. India spends only 0.9 per cent of GDP on research and development, which is much below that of China, UK and Israel. We need to step up our expenditure on research to pursue large scale innovation. The private sector, which contributes one-fourth of our country’s expenditure on research and development, should increase their share of spending to levels prevalent in countries such as Japan, US and South Korea. Our universities, technical institutions and research centres are supposedly the fertile grounds for innovation. Academic and research positions in them are afflicted by talent deficiency. Our systems are not conducive to retaining talent, and we lose many of them to organizations within and outside the country. We should evolve mechanisms to discourage this outflow of intellectual capital. At the same time, we must encourage Indian scholars working abroad in important research and teaching positions to return to the country to take up short-term assignments. Such a policy could reap our nation with benefits such as transmission of ideas and new methods of teaching and research. Our priorities for innovation should be conditioned by our socio-economic realities. The Indian innovation strategy should focus on generating ideas that promote inclusive growth and benefit people at the bottom of the socio-economic pyramid. Our higher academic institutions should play a vital role in inclusive innovation. They should mentor grassroots innovators for development of their ideas into useful products. 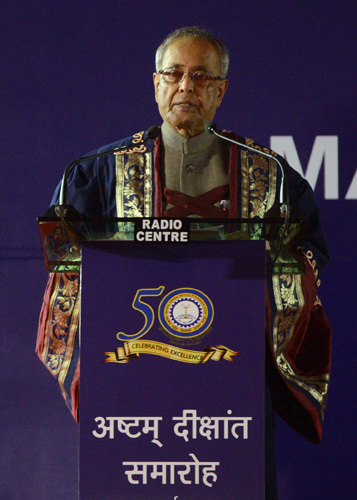 A recommendation was made in a Conference of Vice Chancellors of Central Universities held in the Rashtrapati Bhavan this year to set up Innovators Clubs in Central Universities. They would be a platform for the teaching and student communities and grassroots innovators to exchange ideas. I am hopeful of this initiative being replicated in other institutes. I call upon NIT Jaipur to encourage innovators in this region. Knowledge is indivisible. You may be a student of a particular discipline. But remember that in the supreme pursuit of truth, different disciplines have to complement one another. To understand the complete truth, you must diligently pursue holistic learning. Be open to seek knowledge in whatever form it is presented to you. As you leave your alma mater today and prepare yourself for tomorrow, be assured in the knowledge that you have gained here. Everyday of your life will be an opportunity for you to learn. The thirst for knowledge should remain with you for life. Use your knowledge for the greater good of people. Be successful, more so in the number of lives that you touch. I wish you all the very best in life and career. I also wish the management and faculty of this Institute all success. It is my earnest hope that this Institute achieves greater intellectual eminence in the future.